Why Do You Work in a Museum? I smile, nod and the conversation continues. There’s nothing wrong with being a history nerd (history nerds provide my livelihood), and I take pride in that part of who I am – but as a museum professional – there is so much more to what I do. Would you say, “Oh, you’re an Excel nerd, huh?” to the CFO of a multi-million dollar corporation? I work IN history. I studied and have a degree in history. I am surrounded by historical objects. I am constantly involved in conversations regarding contemporary interpretation of historical events, people and places. Museums are not a hobby for me; they are a huge part of my life. I work in a museum because history (thanks to my parents for introducing me to dinosaurs at such a young age!) and educational access/participation is my passion. I received some great feedback. 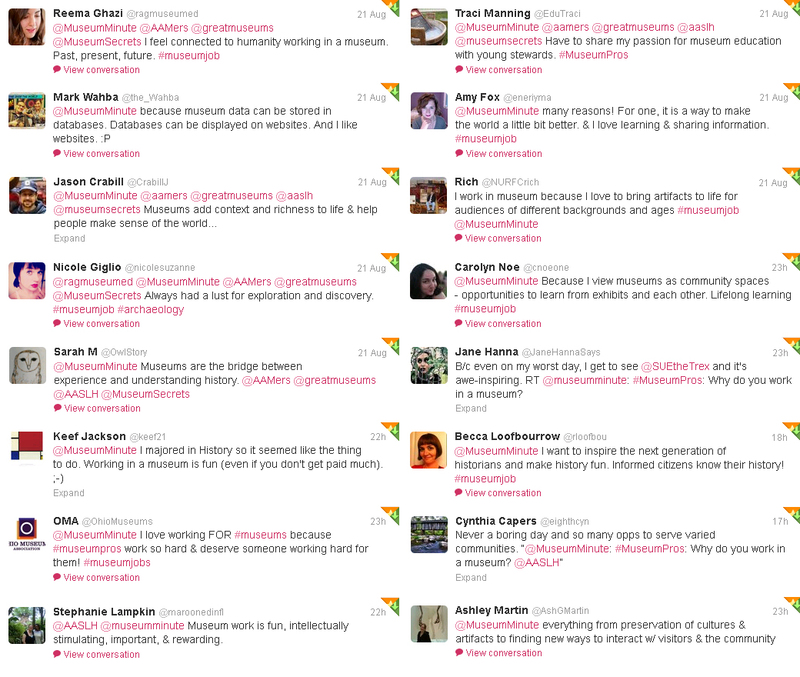 Thank you to everyone who participated in the #museumjob discussion! If you’re on Twitter you should follow these museum professionals, stat. Do you have a favorite? Do you personally identify with any of the tweet responses above? @OwlStory does! So, given the great response in the twitterverse, I’d like to broaden the conversation to this forum, as well. Why do you work in a museum? If you’re looking for a museum job, why do you want to? Tags: History Nerd, Museum Job, Museum Professional, Twitter. Bookmark the permalink. Previous post ← An Open Letter to the President: Call Me Maybe? Museums are places where we can explore humanity’s collective creative output and I love being part of that. Even though I’m in-between museum gigs (and actively looking), they will always play a huge role in my life. I love watching that moment when someone learns something new – a new connection, a new fact, a new idea, a new way of doing something. And then, they get excited about learning more. That moment happens ALL THE TIME in museums. I’d love to think that those moments of discovery could be common place, in every person’s life; but until then, I’ll work to make them happen in the museums setting. I volunteer in the museum world (Cincinnati Museum Center) in hopes to be a museum professional one day. I choose to give my all in effort to feed my passion for history, work with a great museum staff and positively interact with a wide variety of visitors. Specifically, at CMC, for me its about how versatile the venue can be. CMC is not just a museum with exhibits but for example, a place for dinners, special events and of course galas. You never know what you may see! I believe you must have a passion for this business, because as Jamie said, we all are ‘IN history’, it doesn’t ‘turn off’.